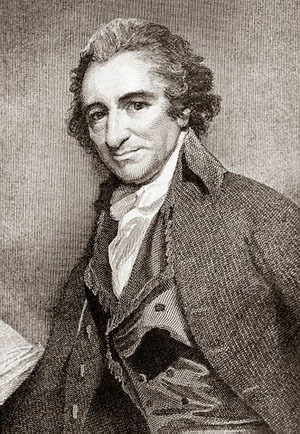 Thomas Paine (January 29, 1737 – June 8, 1809) was an English-American political activist, author, political theorist and revolutionary. As the author of two highly influential pamphlets at the start of the American Revolution, he inspired the Patriots in 1776 to declare independence from Britain. His ideas reflected Enlightenment era rhetoric of transnational human rights. He has been called "a corsetmaker by trade, a journalist by profession, and a propagandist by inclination". "Thomas Paine had passed the legendary limit of life. One by one most of his old friends and acquaintances had deserted him. Maligned on every side, execrated, shunned and abhorred- his virtues denounced as vices- his services forgotten- his character blackened, he preserved the poise and balance of his soul. He was a victim of the people, but his convictions remained unshaken. He was still a soldier in the army of freedom, and still tried to enlighten and civilize those who were impatiently waiting for his death. Even those who loved their enemies hated him, their friend– the friend of the whole world– with all their hearts. On the 8th of June, 1809, death came– Death, almost his only friend. At his funeral no pomp, no pageantry, no civic procession, no military display. In a carriage, a woman and her son who had lived on the bounty of the dead– on horseback, a Quaker, the humanity of whose heart dominated the creed of his head– and, following on foot, two negroes filled with gratitude– constituted the funeral cortege of Thomas Paine. An avidity to punish is always dangerous to liberty. It leads men to stretch, to misinterpret, and to misapply even the best of laws. It is the duty of a patriot to protect his country from its government. It matters not where you live, or what rank of life you hold, the evil or the blessing will reach you all. Man cannot make, or invent, or contrive principles; he can only discover them, and he ought to look through the discovery to the Author. Men did not make the earth. It is the value of the improvements only, and not the earth itself, that is individual property. Every proprietor owes to the community a ground rent for the land which he holds. Society in every state is a blessing, but government, even in its best state, is but a necessary evil; in its worst state an intolerable one. The most detestable wickedness, the most horrid cruelties, and the greatest miseries, that have afflicted the human race, have had their origin in this thing called revelation, or revealed religion. It has been the most dishonorable belief against the character of the divinity, the most destructive to morality, and the peace and happiness of man, that ever was propagated since man began to exist. When man has so far corrupted and prostituted the chastity of his mind, as to subscribe his professional belief to things he does not believe, he has prepared himself for the commission of every other crime.